This is the fourth in a series of "murder mystery" posts about the Smithsonian’s participation in the 1934 Hancock-Pacific Galapagos Expedition. 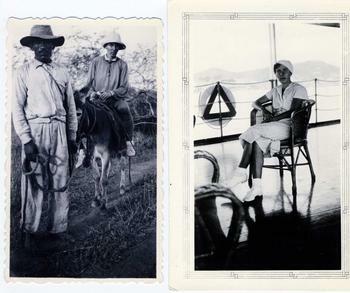 While on a series of expeditions aboard the vessel the Velero, Smithsonian scientist Waldo L. Schmitt encountered an odd assortment of German Utopian colonists in the Galapagos Islands. What follows is an exploration of a series of colonist deaths that occurred on the Islands, and were recounted by Schmitt in his diaries and papers in the Archives’ collections. WARNING: The following video contains images of human remains, which some viewers may find disturbing. In December 1934, the Velero arrived at Marchena Island in the Galapagos. As the ship approached the shore, Smithsonian scientist Waldo L. Schmitt and his colleagues spotted the two bodies that had been reported by passing fishing boats. The story of the Charles Island colonists, which had seemed like a screwball farce peopled by eccentrics, abruptly turned to tragedy. The bodies had been mummified by the heat of the sun baked and arid island, and were immediately recognized by those on the Velero as Rudolph Lorenz, the young lover of colonist; Eloise Bosquet de Wagner Wehrhorn (aka, the Baroness); and Captain Nyggerud, the skipper of a small fishing boat that made regular trips between the islands. 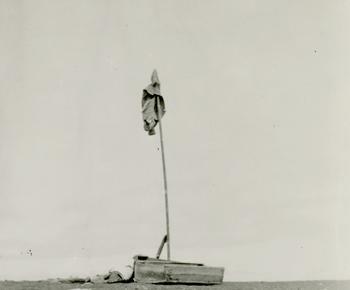 The two men had erected a mast with signal flag before they died; under it rested a small skiff—but no oars were found. Scattered about were the remains of a bird and a sea lion that had evidently been killed and eaten by the castaways. There was food, but no drinking water to be had on Marchena Island; the men had died of thirst. A more hopeless scene could not be imagined. One was lying beside a crude homemade little skiff… The other, Lorenz undoubtedly, on his side right on the hot, coarse black lava sand…Both were lying high up on the sand in the hot sun and mummified by the driest conditions in the lowlands of all islands; completely dehydrated, the doctor said, and dead of thirst. The poor devils; Lorenz, if murderer, got what he deserved, but the Norwegian . . . left . . . a wife who had come all the way from Norway to marry him . . . and was carrying a child when we were there last year. “Hancock-Galapagos Expedition, 1934-1935 Diary” by Waldo L. Schmitt. Smithsonian Institution Archives, Record Unit 7312, Box 87. On December 2, 1934, the Velero dropped anchor at neighboring Charles Island, where they found the island and its inhabitants deeply changed. Members of the expedition were surprised when their friend, Dr. Ritter, didn’t meet them at Post Office Bay. They soon encountered Dr. Ritter’s weeping and distraught companion, Dore Koerwein, who led the group to Ritter’s grave. Schmitt pieced the story together through conversations with Margarete Wittmer, who witnessed the events on Charles Island since the Velero’s last visit. “Ritter said [that] when he took sick; [he] thought [it] must be that he was being punished for having entertained the thought of killing the Baroness—she was such a plague to him that he seriously entertained the idea a number of times.” “Hancock-Galapagos Expedition, 1934-1935 Diary” by Waldo L. Schmitt. Indeed, the Baroness was disliked by many of the other island inhabitants for her scandalous love life and flagrant desire for celebrity and money. In the end, Friedrich Ritter died on November 2, just as the Velero set off from America. He had only five months to savor life on the island post-Baroness. At the Baroness’ compound, things were even worse; since this was usually the rainy season, the tourist yachts kept away—and the three inhabitants of the Baroness’ “Hacienda Paradise” depended on them for provisions. Their dwindling resources caused increasing tension; Lorenz burned slowly with anger as the Baroness showed favoritism to Philippson. Around the beginning of March, the two men came to blows. When Lorenz, the loser in the Baroness’ complicated love triangle, was driven out, he found refuge with the Wittmers. There are as many explanations as people on board almost, but there is no telling till we can piece together the stories . . . at Charles Island . . . The Wittmers will be my meat . . . they should know the most as they lived nearer the Baroness. 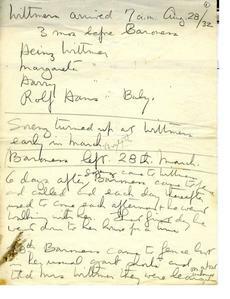 “Hancock-Galapagos Expedition, 1934-1935 Diary” by Waldo L. Schmitt, Smithsonian Institution Archives, Record Unit 7312, Box 87. On the 28th of March, Mrs. Wittmer reported, the Baroness came to the Wittmer’s fence and excitedly called for Lorenz, who was off gathering wood with the Wittmer’s older son. Mrs. Wittmer listened to her news—American friends had arrived in their yacht and invited her and Philippson on a voyage to the South Seas. They were leaving immediately and would probably not return; Lorenz could become sole master of the house and animals they left behind. Mrs. Wittmer conveyed the message to Lorenz on his return, and he left for “Paradise.” On his return, he related that he found the cottage empty, the luggage and donkey missing, and the disorder of a hasty departure all around. Of Robert Phillipson and the Baroness, there was nothing to be seen. Lorenz stayed at the deserted “Paradise” for the next several weeks, returning to the Wittmers for meals. He then moved to Post Office Bay, where he waited for a passing ship. However, when an acquaintance, Thomas Howell, Sr. of Miami, arrived in his yacht, Lorenz refused to leave with him. Finally, on July 20th, the fishing boat captained by the Norwegian, Nyggerud, arrived. Mrs. Wittmer recalled that by then Lorenz was in a terrible hurry and even though the sea was dreadfully high, offered the skipper extra money to leave immediately. Two days later the deserted boat was seen drifting off Chatham Island. Nyggerud was known to be reckless; his rickety boat had no sails and an unreliable engine. It was believed that they had engine failure in rough seas and abandoned ship, setting out in the skiff to try and reach the nearest land. Unfortunately, that was the waterless Marchena Island. So ran Margarete Wittmer’s account; however, there was another witness to the events of March 1934: one who reported from beyond the grave. Among Waldo Schmitt’s papers is a typescript that Dr. Ritter wrote shortly after the disappearance of the Baroness and Philippson. 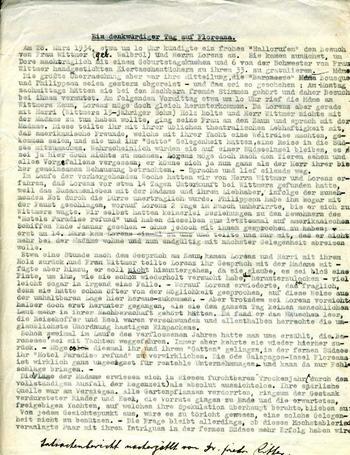 My German is rusty, but I was able to translate the document, and discover some telling discrepancies from Ms. Wittmer’s story. One was that the Ritters hadn’t witnessed a ship in Post Office Bay since January 1924.Their home possessed the best view of the bay, and they were the first to spot and welcome incoming ships—such as the American yacht that supposedly spirited the Baroness away. In addition, on the 28th of March—the day Mrs. Wittmer said that the Baroness made her trip to notify Lorenz, and then departed the island—was Dore Koerwein’s birthday. Dr. Ritter recalled Lorenz and Mrs. Wittmer arriving at their house that morning, with a cake and presents to celebrate, and excitedly telling them the news that the Baroness had sailed off to the South Seas. Dore Koerwein left Charles Island on the Velero, returned to Germany, and wrote magazine articles about her life on Charles Island. She believed that Lorenz had indeed murdered his companions, and burned the bodies in a fire of the island’s acacia wood, hot enough to completely destroy them. She also thought that the Wittmers may have corroborated the story of the Baroness’ departure out of pity for Lorenz. 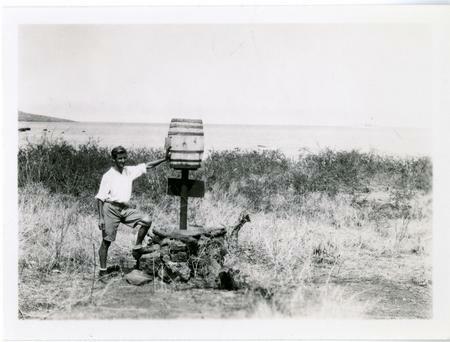 The Wittmer family stayed and prospered in their island home; their descendants pioneered the Galapagos tourism industry with their company, Rolf Wittmer Turismo, Ltd. Margarete Wittmer loved telling visitors the mystery story of Charles Island—and always hinted that she knew more than she could say. The Velero returned to the United States after a successful expedition that collected the most Galapagos wildlife specimens since Darwin’s visit. Waldo Schmitt also collected numerous magazine and newspaper articles concerning Charles Island’s colony; they remain among the papers that he left to the Smithsonian Institution Archives. As for The Baroness and Robert Philippson, were they killed by Lorenz during a fight or in cold blood, or did they vanish into the obscurity of some South Sea Island? I’m inclined to agree with Dore Koerwein. My theory is that Lorenz, beaten, humiliated, and driven out by Philippson and the Baroness, hid in the brush until he was able to exact his revenge. He got hold of one of the numerous guns with which the compound was stocked and confronted his former lover and his rival—or picked them off from his hiding place. Did Lorenz confess his guilt to the Wittmers when he appeared at their home—or did his story of departure on an American yacht deceive them? In any case, the fact that Lorenz, desperate to leave the island, refused Thomas Howell’s offer to take him from Charles Island seems suspicious to me. The reason for Lorenz’s refusal could be that Thomas knew Lorenz, the Baroness, and Philippson from previous visits, and would have asked too many awkward questions. Two hours from here is Hacienda Paradise . . . a little spot where the weary traveler is happy to find some rest, refreshment, and peace on his way through life. Life, this little bit of eternity chained to a clock, is so short after all; so let us be happy, let us be good. At “Paradise” you have no name but one, “friend”. We will share with you the salt of the sea, the vegetables of our little garden, the fruits of our trees, the fresh water running down from the rocks; we will share with you what other friends who passed by gave us. We will spend with you some moments of life and give you the happiness and peace that God put into our heart and mind since we have left the restless turmoil of the metropolis to the quiet of centuries which has laid its mantle upon the Galapagos.